In his commentary on the Letter to the Hebrews, New Testament scholar Edgar McKnight explores the two aspects of Hebrews as covenant--the appeal to the perfection and finality of Jesus Christ and the exhortation to faithfulness based on that appeal. He also highlights the interpretative strategies of the author--strategies that are often strange to modern readers. By bringing the ancient text into the world of present readers and to take readers back to the world of Hebrews, we are able to frame the author's treatment of the problems of our spiritual ancestors from the perspective of our modern world and problems presented in our pilgrimage.In his accompanying commentary on the Letter of James, New Testament scholar Christopher Church presents the letter as something of a biblical and historical fossil, a surviving representative of a once-flourishing Jewish Christianity. The Letter of James exposes a form of early Christianity distinct from the Pauline line that later predominated. In the picture that is created of this early Christian community, we find concerns over ethical responsibility and social justice that still serve to define Christian communities today. - Publisher In his commentary on the Letter to the Hebrews, New Testament scholar Edgar McKnight explores the two aspects of Hebrews as covenant--the appeal to the perfection and finality of Jesus Christ and the exhortation to faithfulness based on that appeal. He also highlights the interpretative strategies of the author--strategies that are often strange to modern readers. By bringing the ancient text into the world of present readers and to take readers back to the world of Hebrews, we are able to frame the author's treatment of the problems of our spiritual ancestors from the perspective of our modern world and problems presented in our pilgrimage. In his accompanying commentary on the Letter of James, New Testament scholar Christopher Church presents the letter as something of a biblical and historical fossil, a surviving representative of a once-flourishing Jewish Christianity. The Letter of James exposes a form of early Christianity distinct from the Pauline line that later predominated. 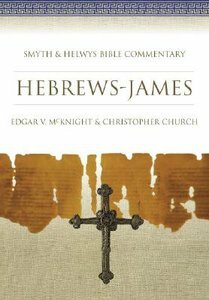 About "Shbc Bible Commentary: Hebrews - James (Smyth & Helwys Bible Commentary Series)"
In his commentary on the Letter to the Hebrews, New Testament scholar Edgar McKnight explores the two aspects of Hebrews as covenant--the appeal to the perfection and finality of Jesus Christ and the exhortation to faithfulness based on that appeal. He also highlights the interpretative strategies of the author--strategies that are often strange to modern readers. By bringing the ancient text into the world of present readers and to take readers back to the world of Hebrews, we are able to frame the author's treatment of the problems of our spiritual ancestors from the perspective of our modern world and problems presented in our pilgrimage. In his accompanying commentary on the Letter of James, New Testament scholar Christopher Church presents the letter as something of a biblical and historical fossil, a surviving representative of a once-flourishing Jewish Christianity. The Letter of James exposes a form of early Christianity distinct from the Pauline line that later predominated. Edgar V. McKnight is research professor and the William R. Kenan Jr. Professor of Religion Emeritus at Furman University. He received degrees in History, New Testament Studies, and Philosophical Theology from the College of Charleston, Southern Baptist Theological Seminary, and Oxford University. Christopher Church serves as Professor of Philosophy & Religion at the Baptist College of Health Sciences (Memphis, TN) as well as Ethics Consultant for St. Jude Children's Research Hospital, where he chairs the clinical Ethics Committee. He is a graduate of the University of Georgia and the Southern Baptist Theological Seminary.